6 Day Course Intensive composing of 3 full weekends. This course is designed to dramatically deepen the active healing connection between the spiritual healer and the crystal kingdom. The advanced crystal healer walks the healing path before proceeding to co-working in healing sessions with others. This course is recommended for healers who work within and through the heart, although this course sets and helps the healer attain a very high standard of training towards working on a professional level with the public, it is the love of working alongside Spirit that is desired. This course is recommended for those who are serious about making a definite commitment to working with the crystals spiritual healers. Attendance of Basic Crystal Healing Course or at least 6 months of working with crystals in active healing sessions. Brian McCullen reserves the right to interview a course candidate if deemed necessary. Each and every candidate gains entrance onto the Advanced Crystal Healing course through the recommendation and Blessing of Spirit. As in, Brian checks with Spirit to see if it is in the healer’s Highest Divine Benefit to attend the course. Intuitive Crystal Healing Diagnostics; Working with the pendulum for ideal crystal placement. Working on a deeper level with the tumblestone crystal for dynamic crystal healing. Working within the crystalline matrix. Self-healing methods with advanced crystal techniques. Receive 4 Crystalline Attunements to enhance the symbiotic relationship between the healer and the crystal devic kingdom. Sending distant healing with crystal energy. Building a relationship and interacting with the crystal guardians. Advanced methods of cleansing the crystalline matrix of the crystals. Repairing the 12-point chakra system with advanced crystal healing techniques. 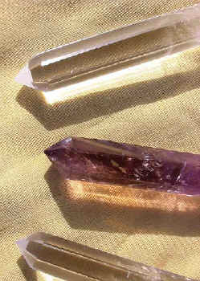 Cleansing and clearing multi-dimensional meridians with crystal wands. Receive information channelled from the crystal devas for various crystals. Repairing organs through Psychic Surgery with the crystal laser wands. Creating and working with Healing Crystal Grids. Clairvoyance & Clairsentience techniques to enhance ‘psychic sight’ and ‘psychic sensing’ of what’s happening in the advanced crystal healing session. Code of Ethics on a professional and spiritual level. Treating physical and emotional conditions with advanced crystal healing. Please note: Course content is subject to change, much of the techniques and information is channelled so the course content evolves as the healer evolves. There is a very high standard of training on this course and daily exercises are given to enhance the energetic skills of the crystal healer. Grounding and energetic re-calibration are daily exercises required to strengthen the crystal healer’s chakra system and aura to channel the very high energies of crystal healing. Every course day we will give and receive an advanced crystal healing incorporating the healing techniques learned during the day. 20 Case studies (5 clients of 4 sessions) are required for this course. Practical exam demonstrating knowledge of healing techniques. Course Fee: € 950.00 euro. The course fee is inclusive of a deposit of €150 euro to reserve a place on the course. If required, the remaining fee can be divided into 3 instalments payable on the 3 weekends. A Certification of Completion (on successfully passing the written theory and practical exam). Ongoing Support during and after the course is completed. Included in the course fee is 3 Crystal Healing Wands; 1 Amethyst (3 inch), 1 Clear Quartz (3 inch), 1 Rose Quartz (3 inch). 3 Weekends: Saturdays 10am-5.00pm & Sundays 10am-5.00pm. A pendulum (for divining/dowsing.) A metal pendulum would be ideal but crystal pendulum or wood pendulum will do. (**It is not necessary to have these crystals for the first weekend of the course, if there are enough people interested Brian will get these wholesale price for the healers).